*Note: I am receiving no compensation from the town of Werfenweng for this article. But if you live there, you’re reading this, and want to compensate me, I’m open to that. 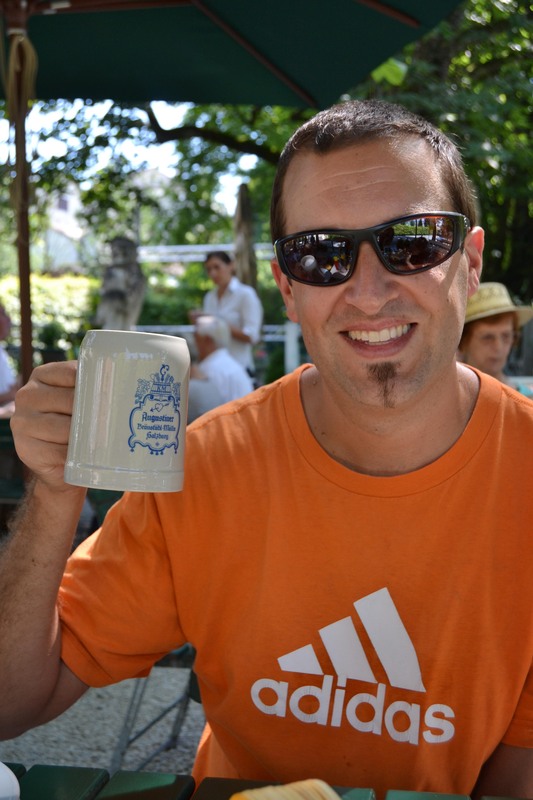 The sixth leg of our trip was in Austria. 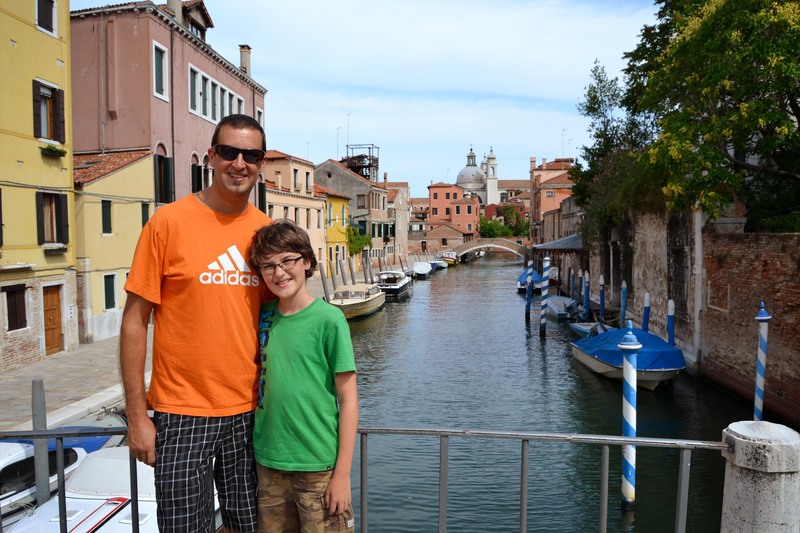 Knowing we only had 5 days, we wanted to pick just one city to explore. 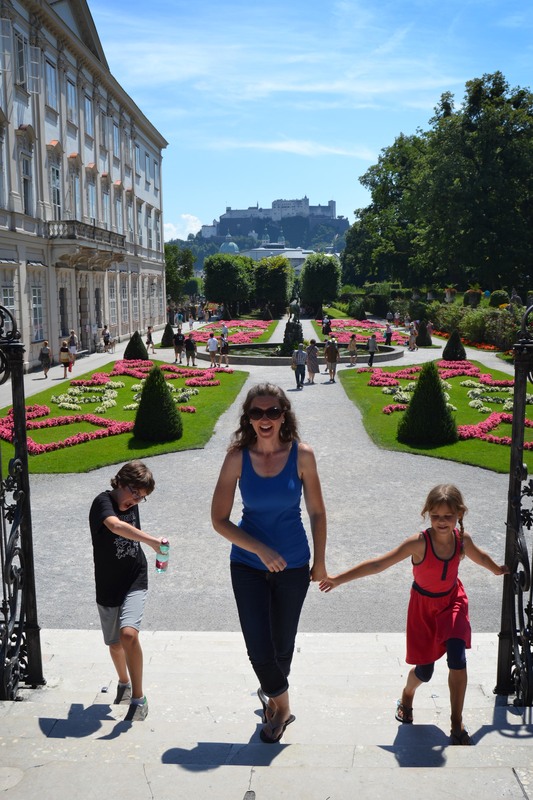 We decided on Salzburg and began our search for accommodation. It turns out that when you’re not that into the classical music and opera scene, you miss out on important memos about things like the very famous and well attended summer music festival held every year in Salzburg. 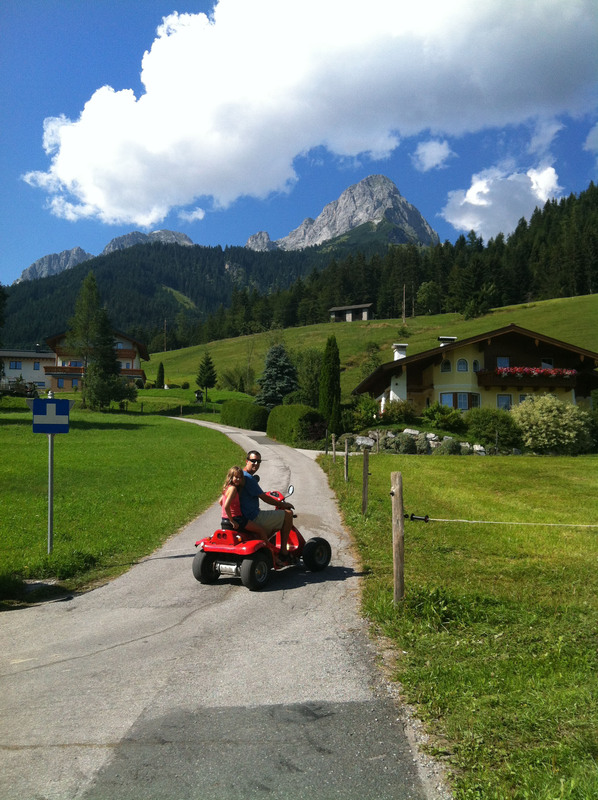 So, since everything that was in our price range was already booked, we re-visited our Austria dreams. 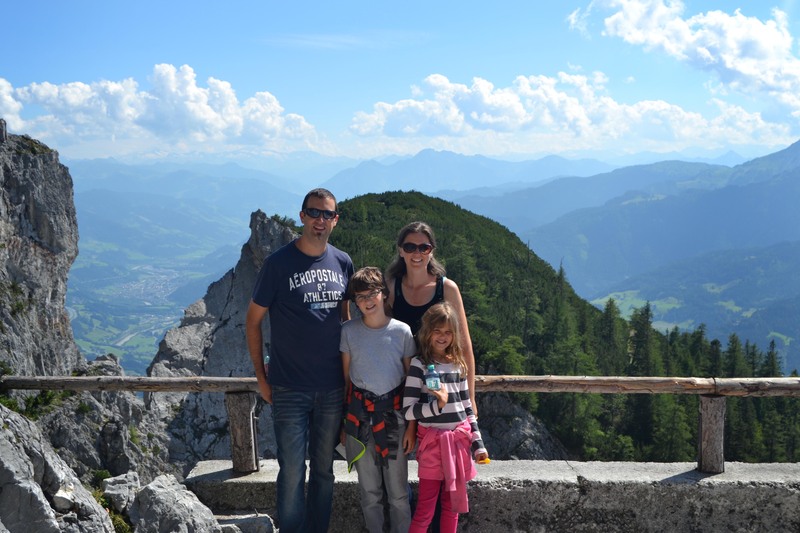 While we really wanted to see Salzburg, our big priority in the Austrian Alps was hiking and biking and soaking up the mountain views. Some fresh air for our desert-parched souls. 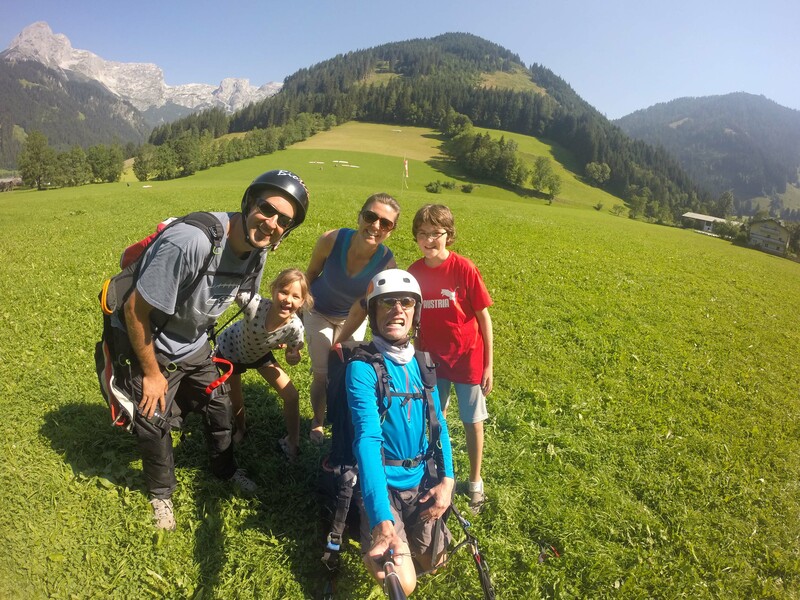 So, we turned our search to the countryside and ended up booking our perfect retirement apartment in Werfenweng, Austria. We were obviously most excited to stay in this quaint alpine village because it’s so fun to say over and over again! Especially when you change those w’s to good German ‘v’s.” Verfenveng, Verfenveng, Verfenveng. I already feel like I’m having more fun! 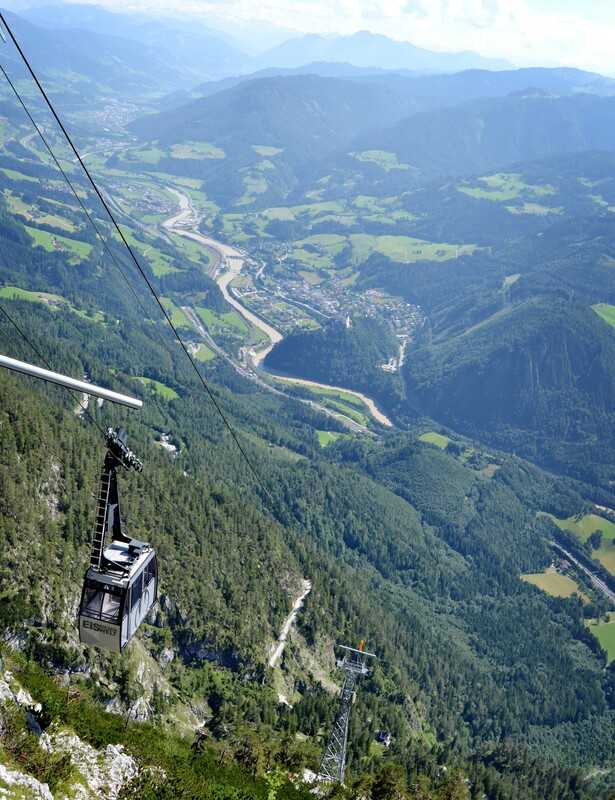 Werfenweng is a popular ski town in the winter and a summer wonderland for hikers and para-gliders. 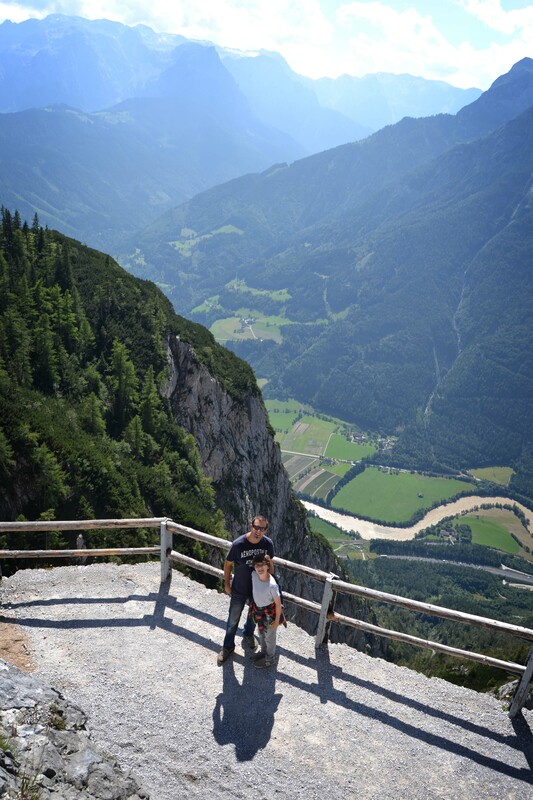 It is 45 minutes from Salzburg, which made a day trip there quite accessible. 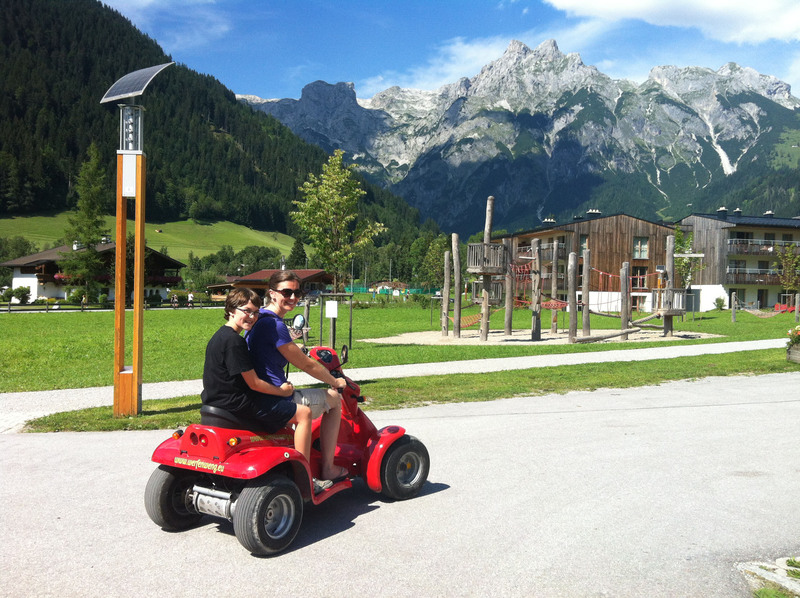 But possibly our favorite thing about staying in Werfenweng was the SAMO program. You pay only 10 euros for a card when you arrive and then you have unlimited access to all of the town’s electric and recreational vehicles for your stay. 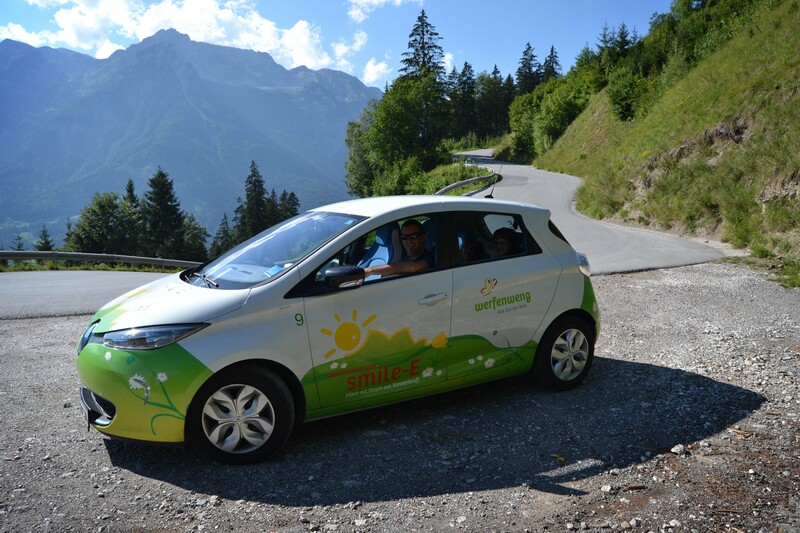 Electric cars, golf carts, electric bikes, mountain bikes, segways, electric quads, etc. 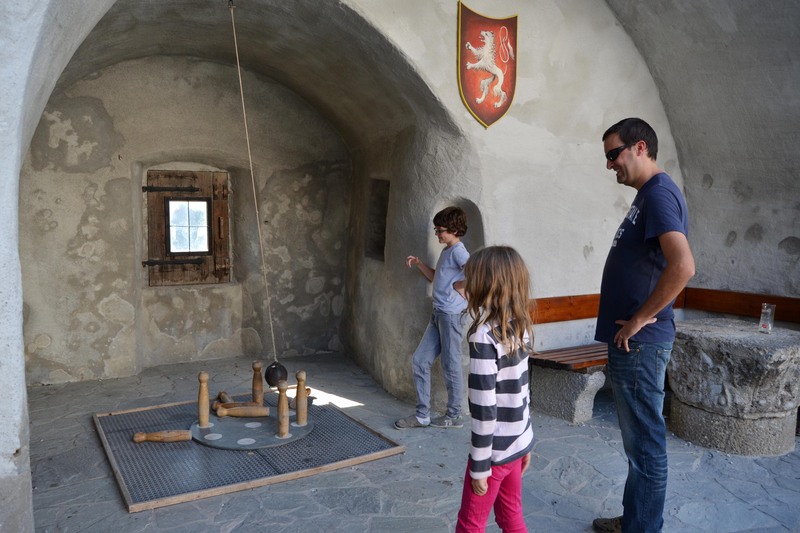 This, all in an effort to spare the environment while still allowing visitors to freely explore and enjoy the surrounding mountains and sites. We took full advantage of all this awesomeness! 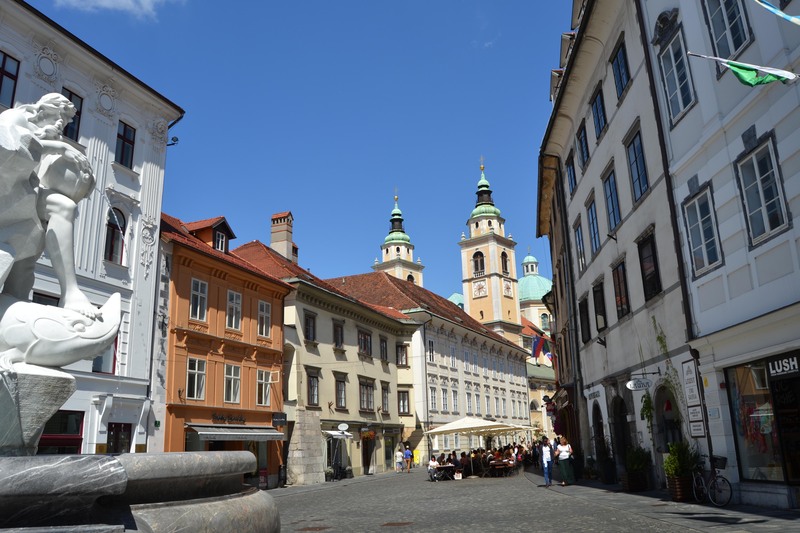 While Rome had some of my favorite sites, Florence had some of my favorite moments, and Ljubljana turned out to be my favorite city, our time in Austria turned out to be my favorite leg of our whole trip. Every morning I stepped out on our deck to the glorious mountain view I’d been longing for. Every day we stayed outside from breakfast until after dark. We breathed and smiled and stayed active and slept deeply. I mean, there was that one morning where Abby kept throwing up and that one afternoon hike where we purposely abandoned her grouchy, stubborn self in the woods until Josiah felt bad enough to return for her. But other than that every-day kind of family drama, this was the definition of my perfect vacation experience. Our first day of exploring on these little beauties. 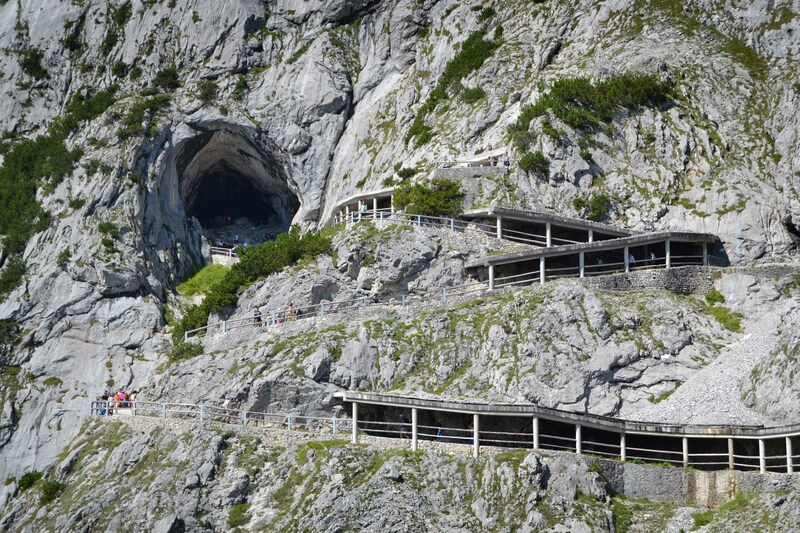 Hiking up to the Eisriesenwelt Caves. There was intermittent vomiting from Abby during this hike, and about one minute before we entered the gondola. I thought her timing was quite thoughtful to the other 15 or so people about to hop in the gondola with us. The gondola ride to ease the hike to the caves. The entrance to the caves. We couldn’t take pictures inside, so you’ll have to go online to see how cool it is. Or better yet, add it to your list of places to visit. The freezing cold air inside immediately cured Abby of her nausea. Is that the Canadian in her? 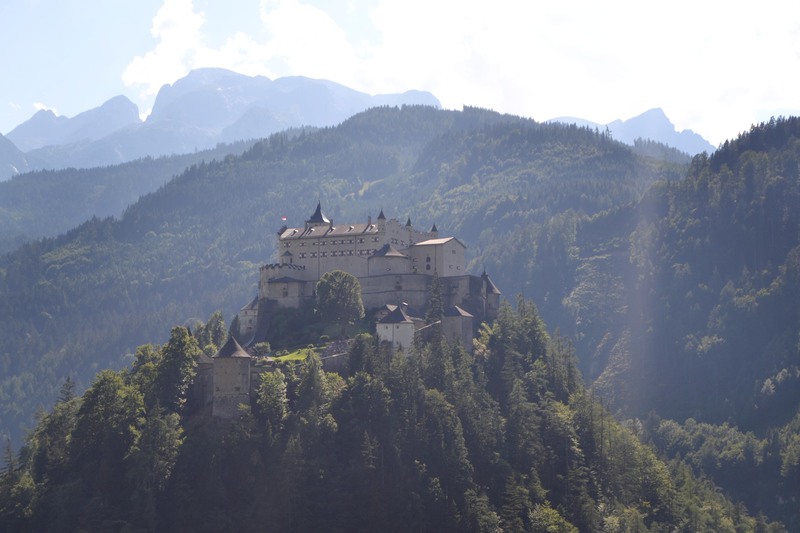 Hohenwerfen Fortress. Beautiful. Medieval Castle entertainment. 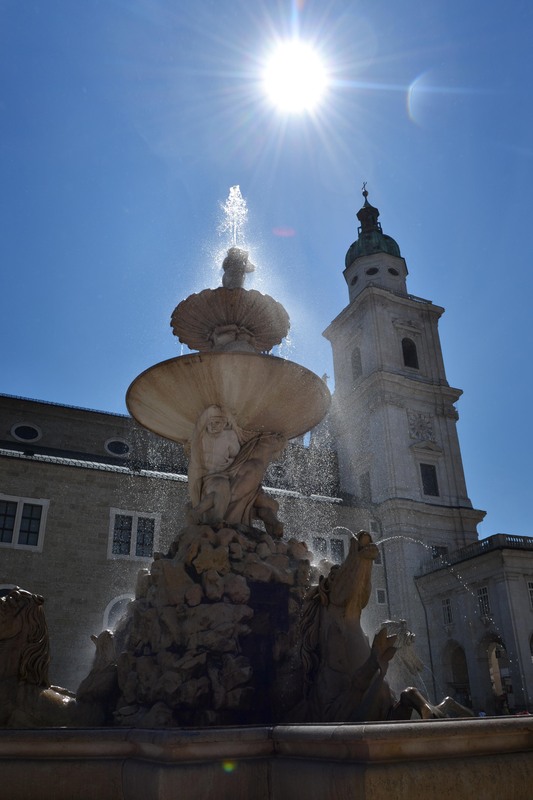 Exploring the beautiful city of Salzburg. 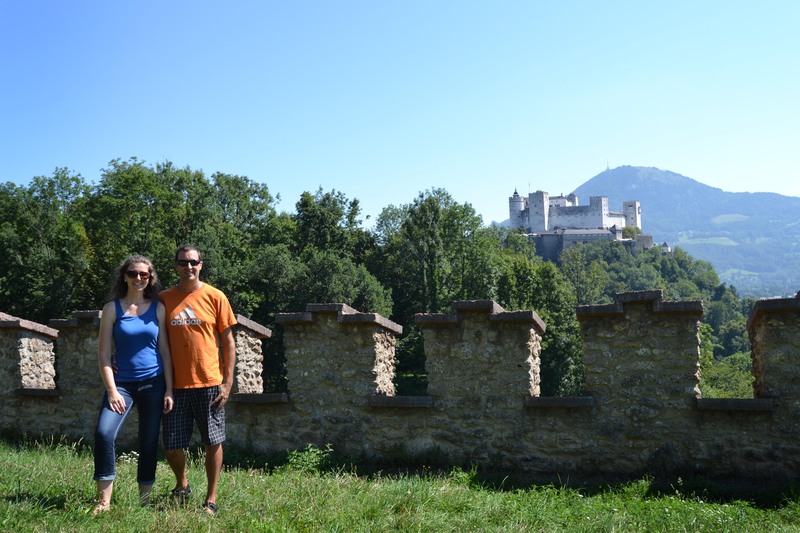 Hohensalzburg Fortress in the background. We stopped for lunch at Augustiner Brau Salzburg. This monastery has been brewing it’s own beer since 1621. We heard it was delicious. The 4 of us could not polish off that tiny little mug, but it was worth the effort. And the pretzels were delicious. 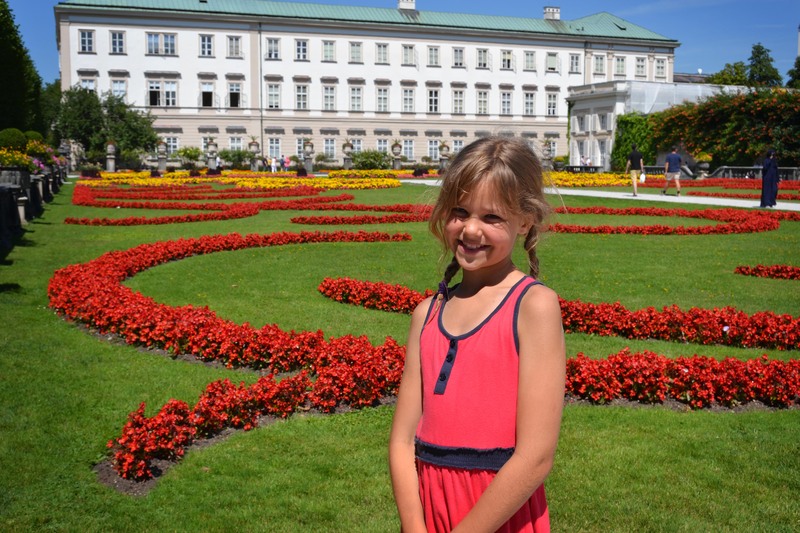 My little beauty posing at Mirabell Gardens. 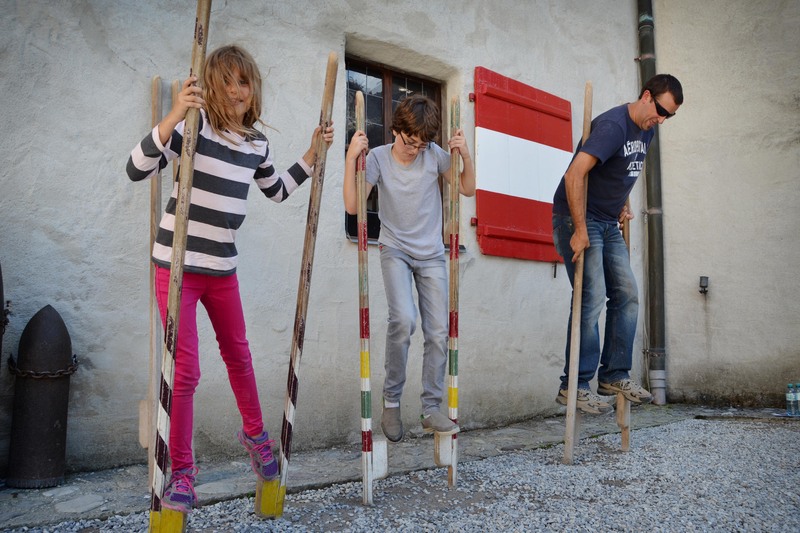 Doing our own little do-re-mi reenactment. 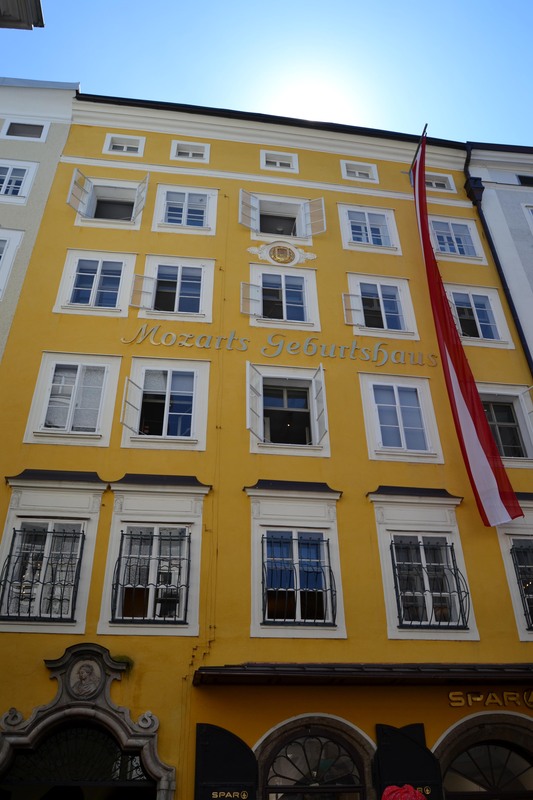 Mozart’s birthplace and family home. 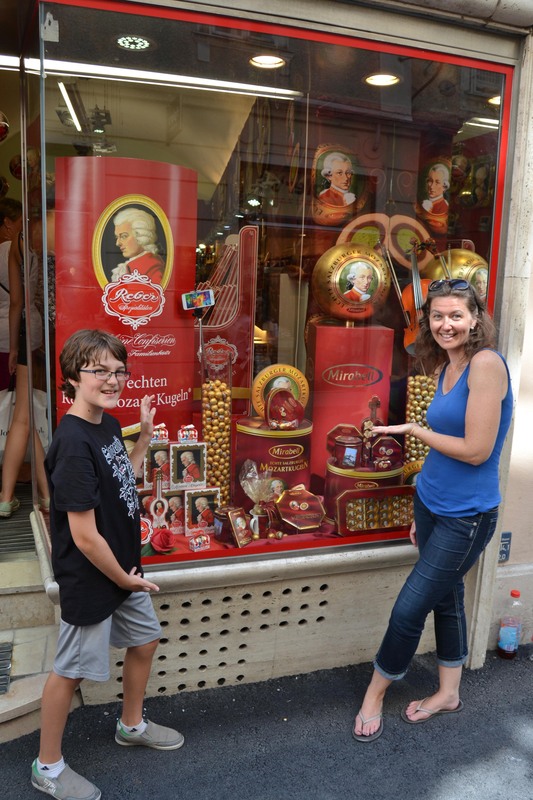 This was cool, but not as good as….. A whole store of Mozartkugel!! I’m still nursing a bag of these, three weeks later. Such restraint, right? 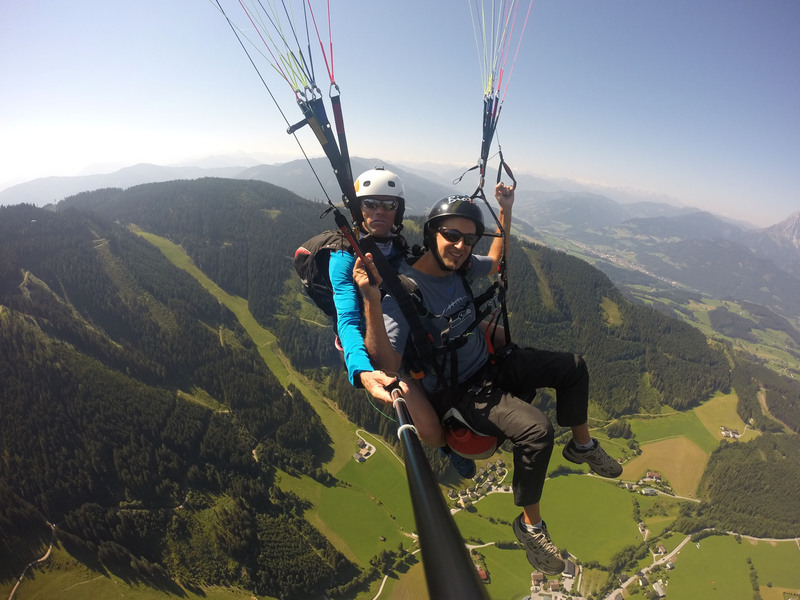 Dwayne’s first para-gliding experience, taking his 38th birthday to great heights! 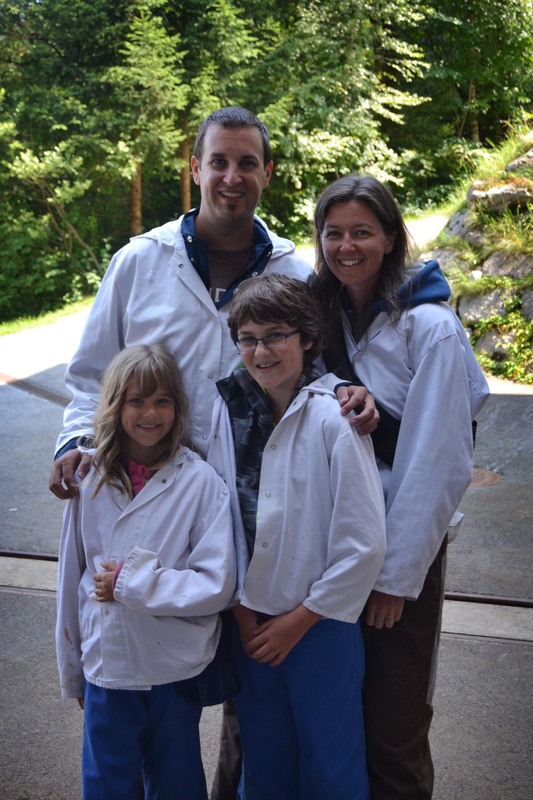 Dressed in our timeless and stylish salt mine exploring outfits at the Hallein Salt Mines. 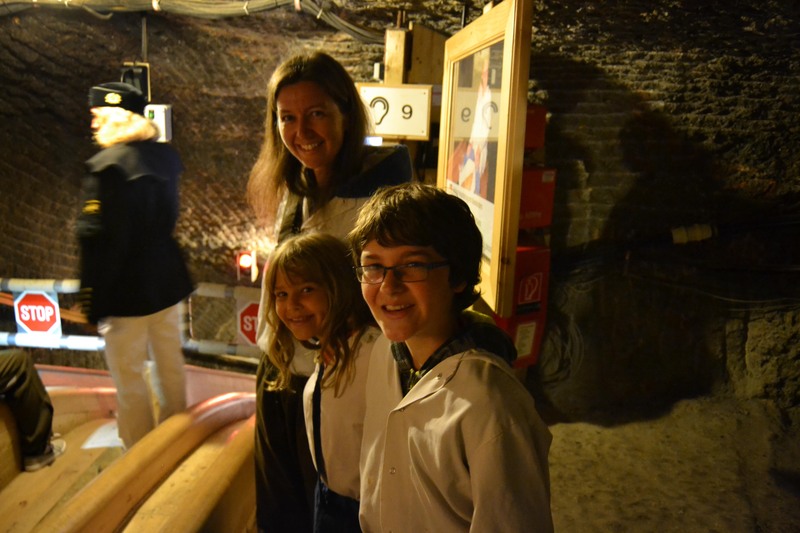 Preparing to use one of the surprisingly fun salt mine slides. None of my pictures here turned out well, but the tour was very fun! 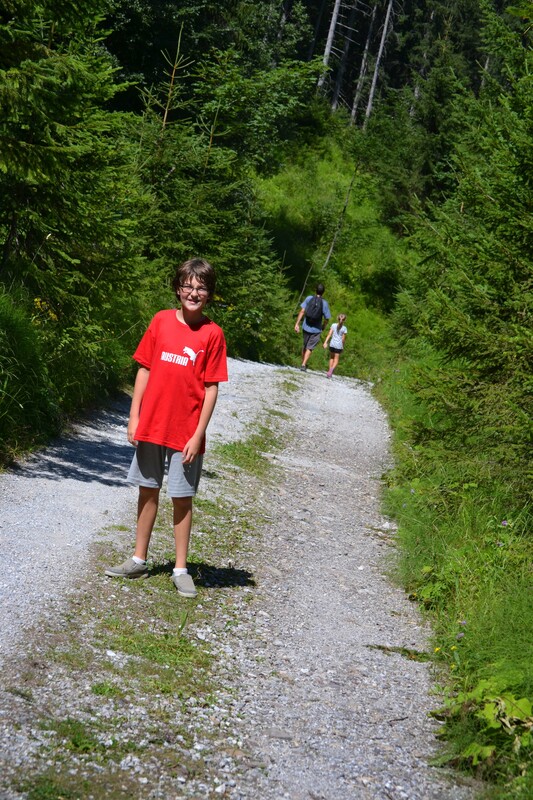 Josiah in his awesome Austria shirt, shortly after he rescued his abandoned sister and we all carried on with our beautiful alpine hike. 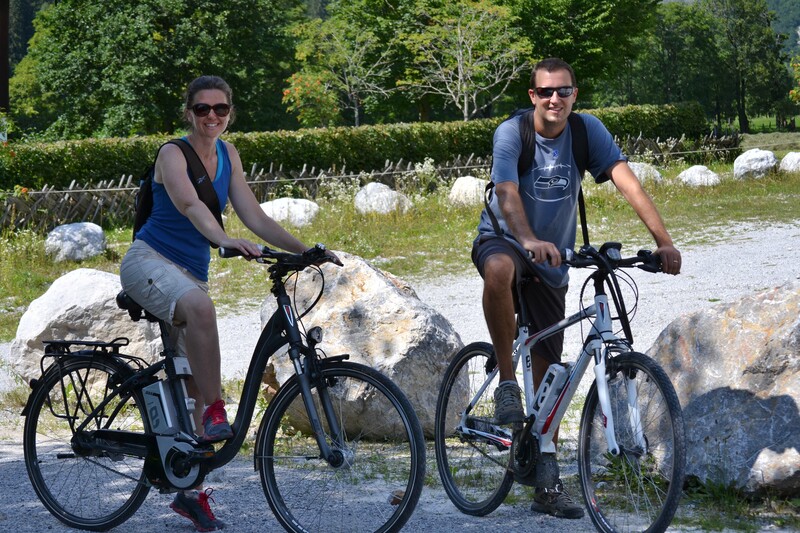 Dwayne and I on our electric bikes. Our kids had to huff and puff and work hard on those hills, while we pedaled slowly and gave the illusion of being physically challenged. Sweet ride. 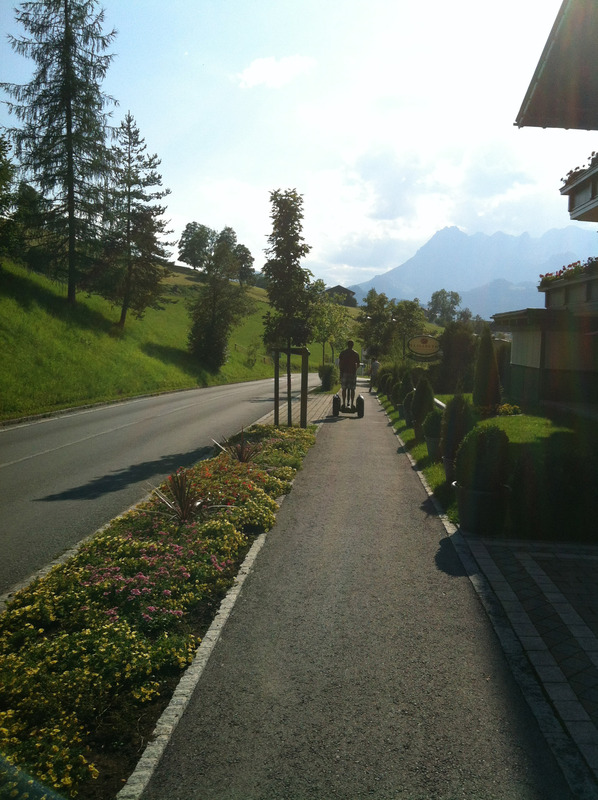 Dwayne and I enjoying a quiet mountainside segway date. Thanks for the memories, Werfenweng. 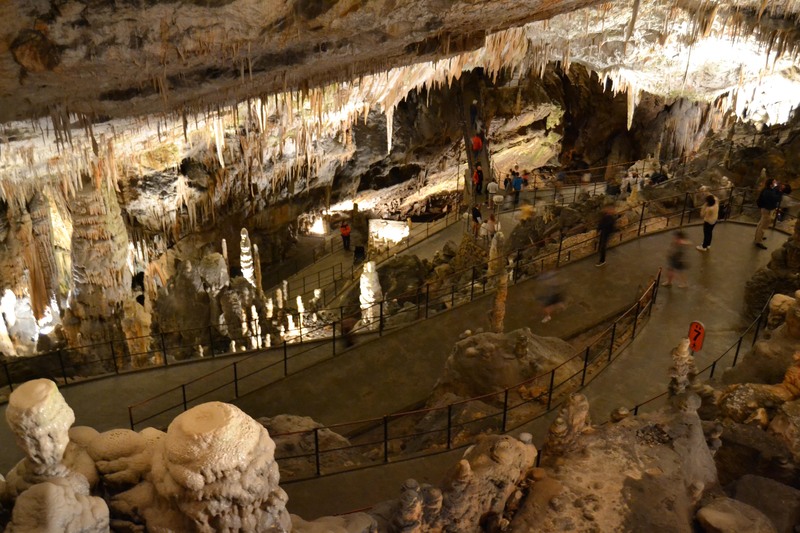 This entry was posted in Travel Log and tagged Austria, Eisriesenwelt Caves, Hohenwerfen, Mirabell Gardens, Mozartkugel, Salzburg, Werfenweng. 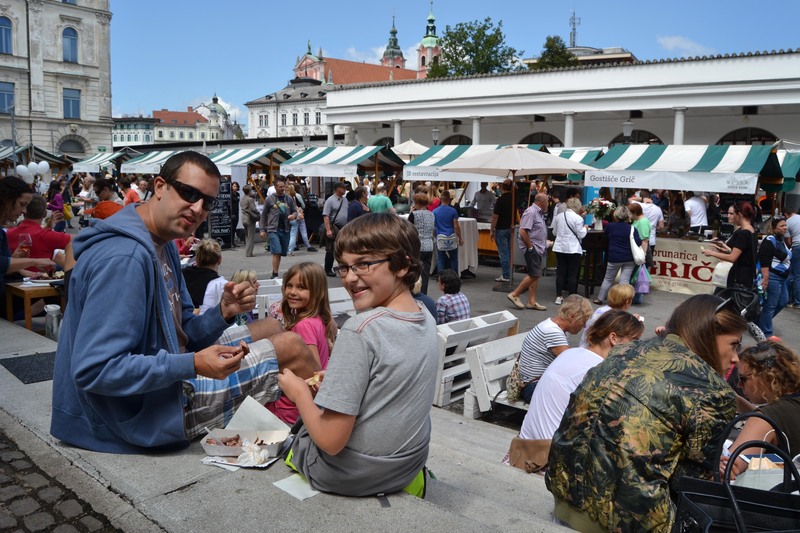 Slovenia, like Sri Lanka, was nowhere on my travel radar before moving here. On an unlabelled map of eastern Europe, I would have been taking a stab in the dark to tell you which country was Slovenia. And I most certainly could not have named any of it’s major cities. But, thanks to a timely conversation with some of our ex-pat friends, right when we were in the middle of the planning stages for our European trip, we decided to add it to our itinerary. 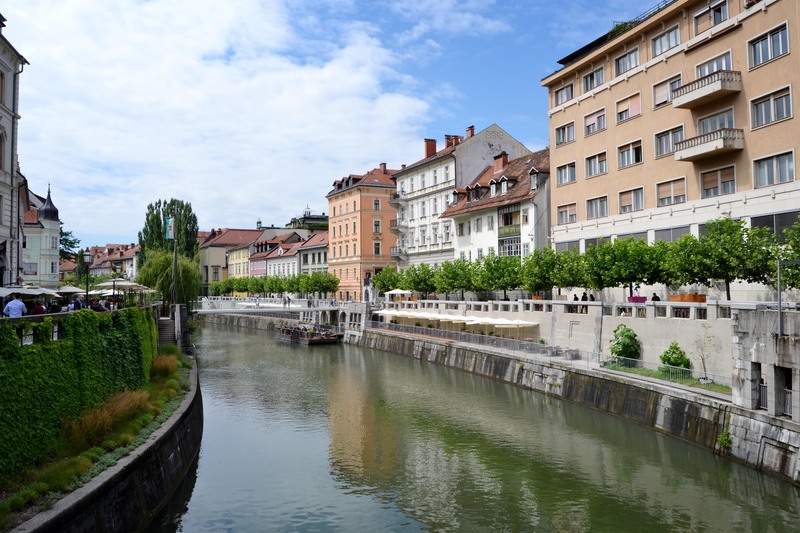 And I’m forever grateful, because out of all the seven cities we stayed in, Ljubljana, Slovenia’s capital, turned out to be my favourite. Anyway, we left Italy behind and basically arrived in the Fraser Valley. It looked so much like Chilliwack. A mountainous valley lush with trees, corn fields for miles, and spotted with cows. If it weren’t for the signs in Slovenian, I could have convinced myself I was back in BC. It was partly wonderful and partly painful in it’s reminders of home. And I forgot, I’m allergic to BC, and it turns out, to Slovenia too. Thankfully, us trusty Shaklee folks had plenty of extra Nutriferon and Vitamin C. Phew. Disaster averted. *A population of about 250,000, with plenty to offer but not too busy. *What seemed like hundreds of coffee shops and bakeries and inviting spots to sit outside, eat, drink, relax, visit, and watch the people go by. *Lots of public activities and events, like the beach volleyball tournament that was happening while we were there, and the Open Kitchen and farmer’s market that happens every Friday in the summer. *Super friendly people who smiled back and me and didn’t seem confused. 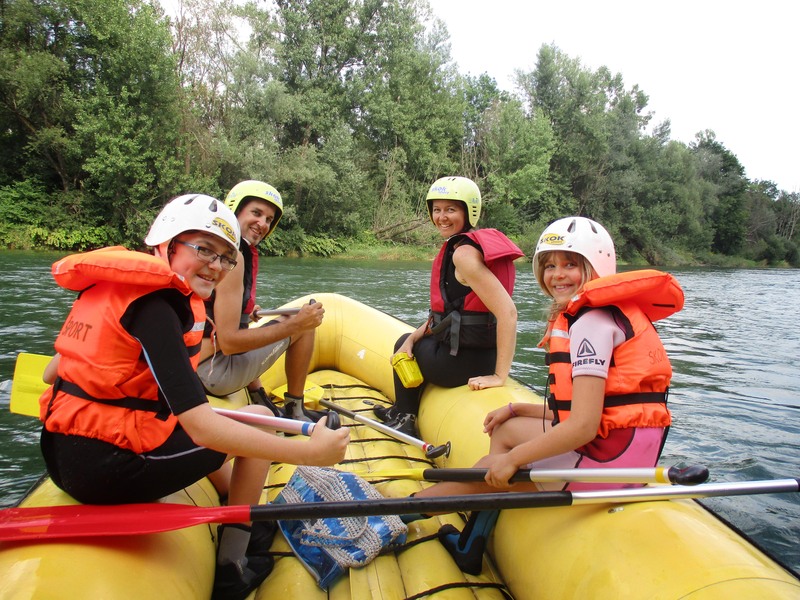 *Quick access to all manner of outdoor activities like hiking, rafting, rowing, zip-lining, rock-climbing, and skiing in the winter. *Dragons. 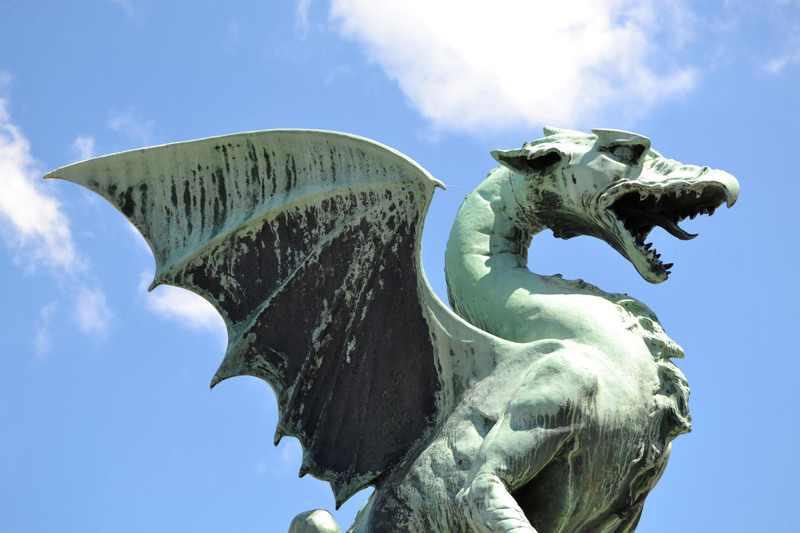 Admittedly, this was more me than Dwayne, but the dragon is the symbol of the city and associated with the legends of Ljubljana’s history, and for some reason I was enamored with them. 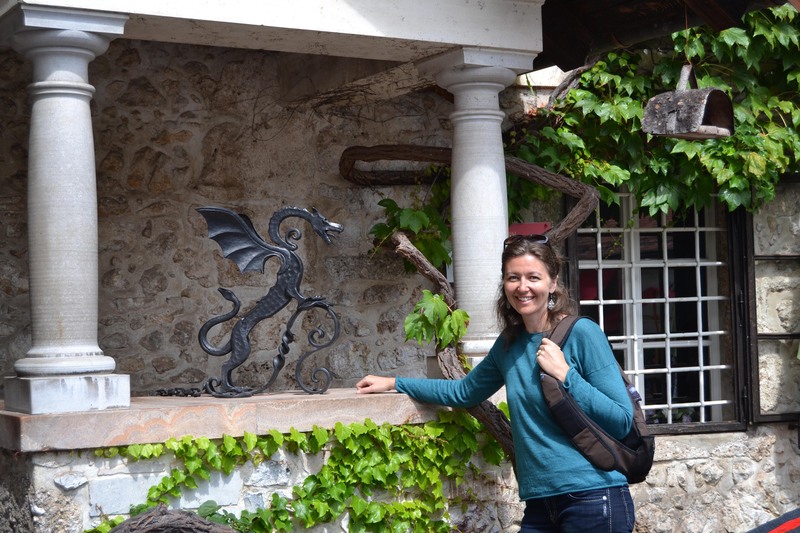 I almost came home with a wrought iron dragon. I do not buy souvenirs. I don’t know what came over me. Thankfully, it seemed too big to fit in my suitcase. Another disaster averted. 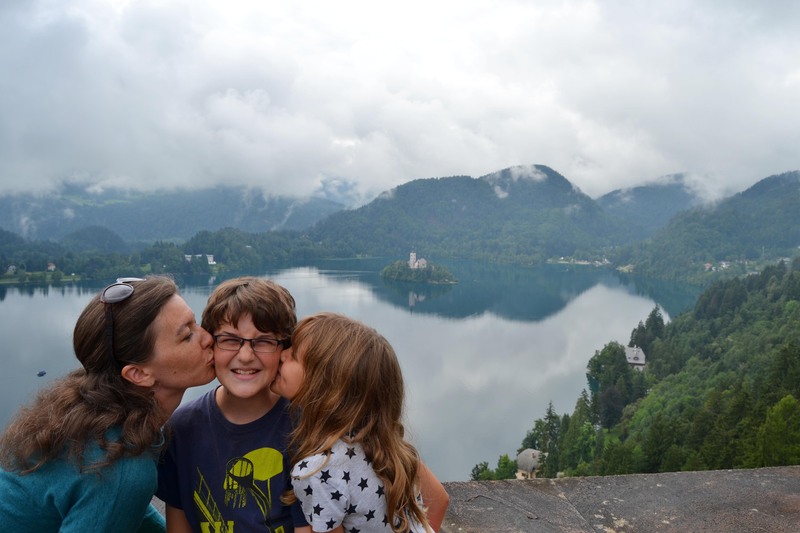 Besides Ljubljana, we also took a day trip to the nearby town of Bled. 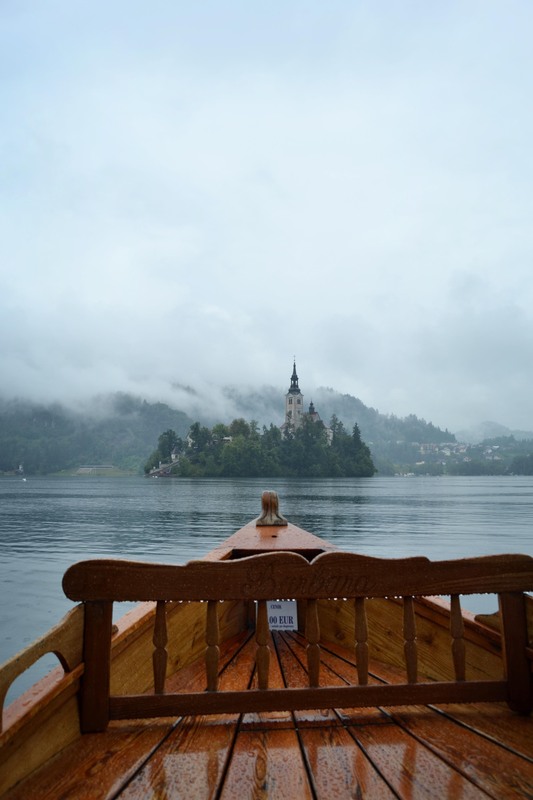 Our visit to Bled included one of only 2 times it rained on our trip. We were the only boat on this serene mountain lake. It was so still, I hardly wanted to push the button on my camera and ruin the peace. 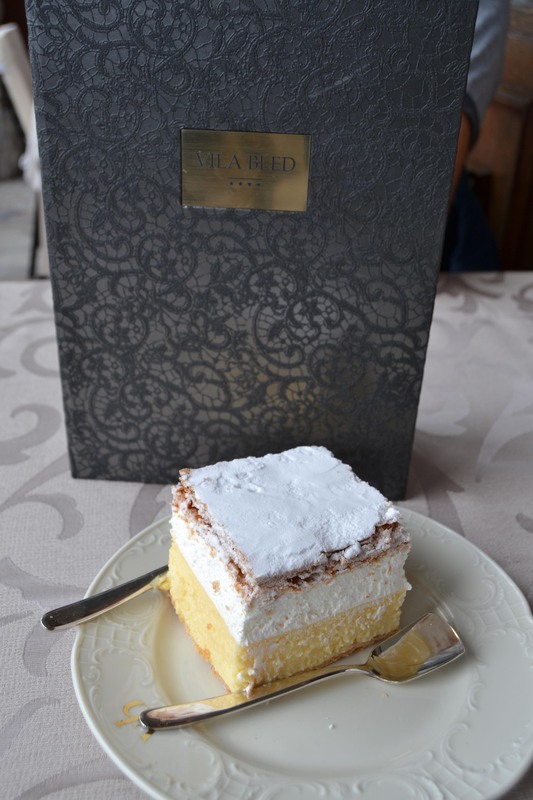 If you’re planning on traveling to Europe in the future, I highly recommend a stop in Slovenia. Stay as long as you can. I hope find myself there again one day. 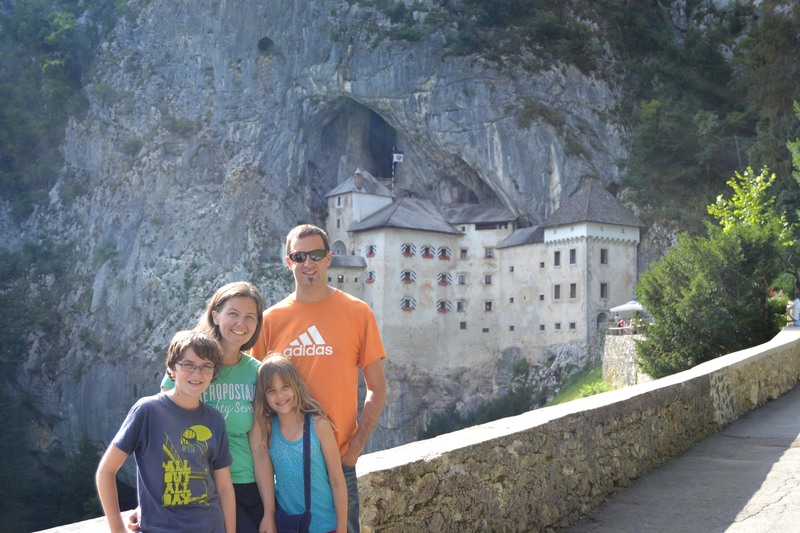 This entry was posted in Travel Log and tagged Bled, Cremeschnitte, Ljubljana, Postojna Caves, Predjama Castle, Slovenia. Venice marked the middle of our seven-leg trip. It also felt like a shift in gears. Where the first three legs were loaded with activities and 15 hour days, this was the beginning of some blank space in our schedule. 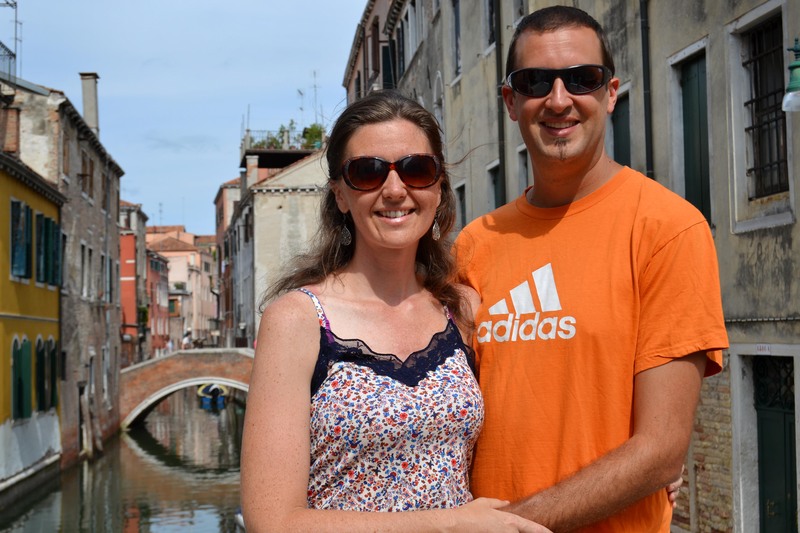 In fact, on our pre-trip itinerary, two of the four days here said, “Get Lost in Venice.” This was perfect timing, as we were very ready to ease off the gas for a few days. 1. 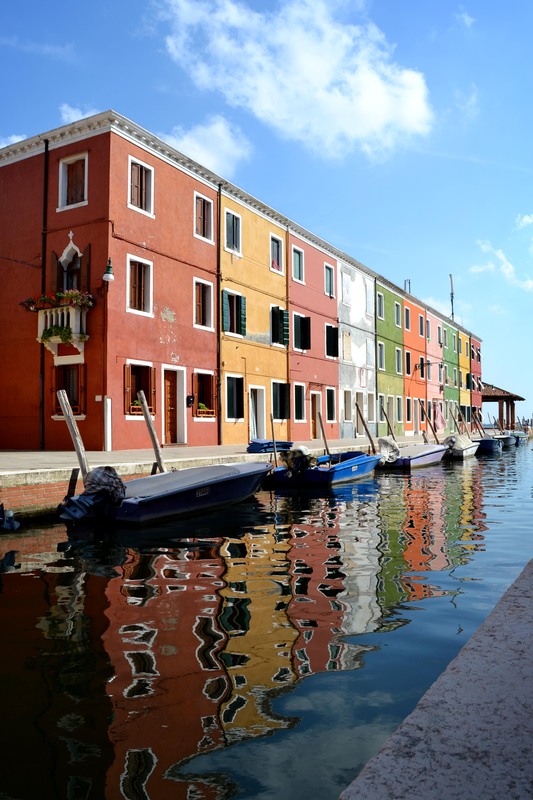 When you leave St. Mark’s Square and the Rialto Bridge, the city is remarkably peaceful. Our first day was spent outside of the crazy tourist areas, and I was blown away by how quiet and deserted the city felt. There were times when we had entire streets to ourselves. We just meandered, took pictures and relaxed. 2. 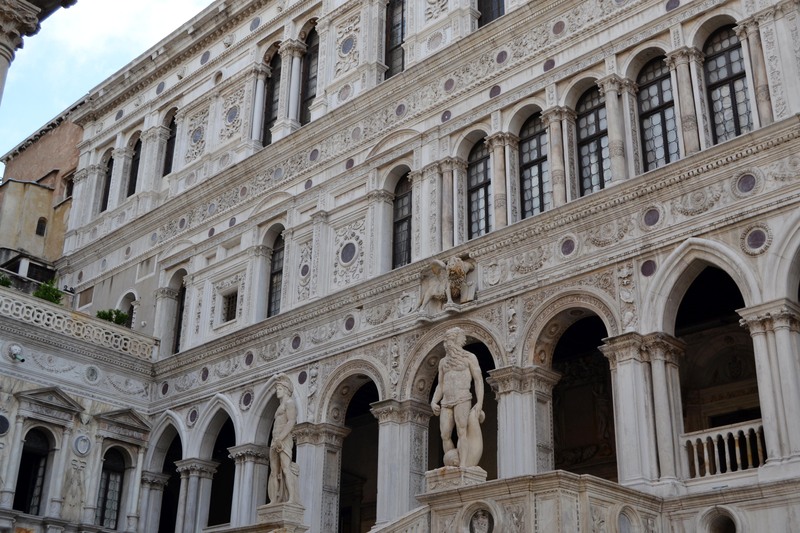 We took the “Secret Itineraries” tour of the Doge’s Palace, and, for me, it was one of the most educational parts of our whole trip. 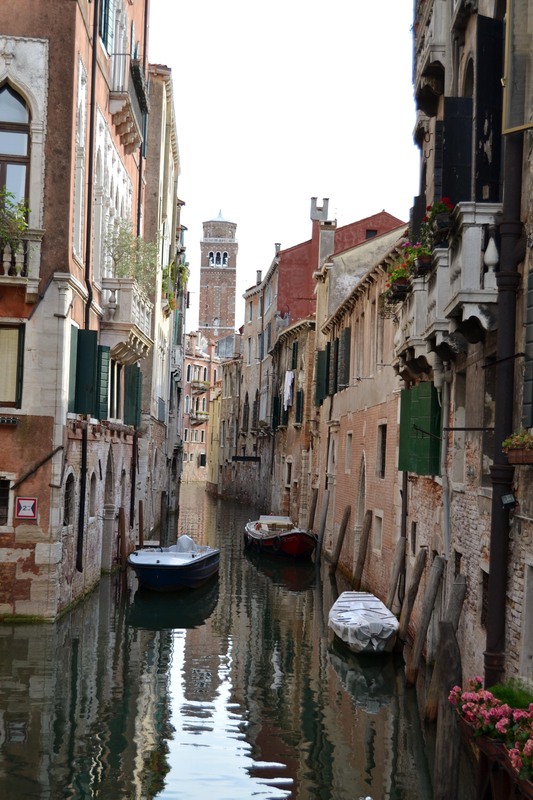 I learned an incredible amount about Venice in one hour, which I believe will really stick with me thanks to the power of good field trips. Traveling really is a phenomenal education. 3. Venice feels like it’s on its way to being deserted ruins. Maybe because it’s sinking. Maybe because the population is one third of what it was a couple of decades ago. Maybe because it seems to be mostly tourists there. Whatever it is, I couldn’t help but think that this was a remarkably unique city that is literally buoyed up by wooden platforms and figuratively buoyed up by tourism, and it simply doesn’t feel like it will last forever. I wonder if a century from now people will stand in line to buy tickets to visit this otherwise abandoned city that was once a vibrant and significant center. 4. Glass making is SUPER COOL! We weren’t allowed to take pictures at the demonstration, so you will have to just imagine how awesome it was to watch this very skilled man make a horse out of a blob of nothing in just a few minutes. Mesmerizing. 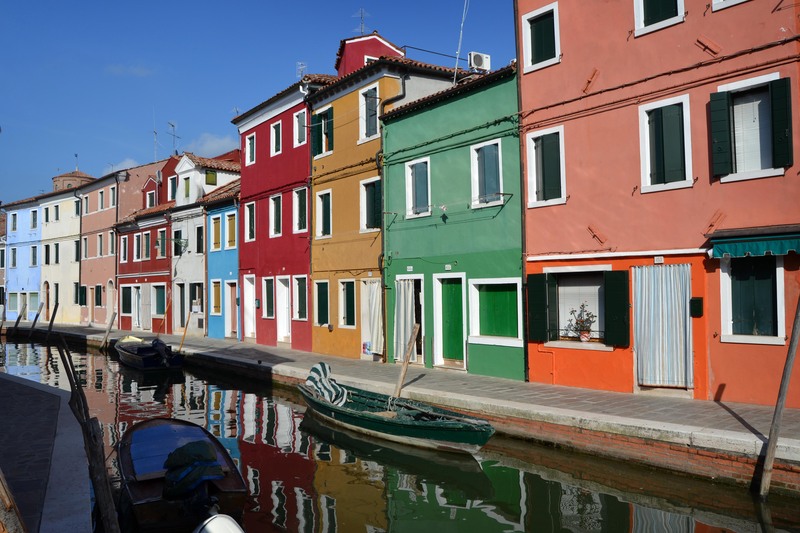 If you visit Venice, the ferry ride to Murano to check this out, along with the cute and colorful houses of Burano, is worth it. 5. 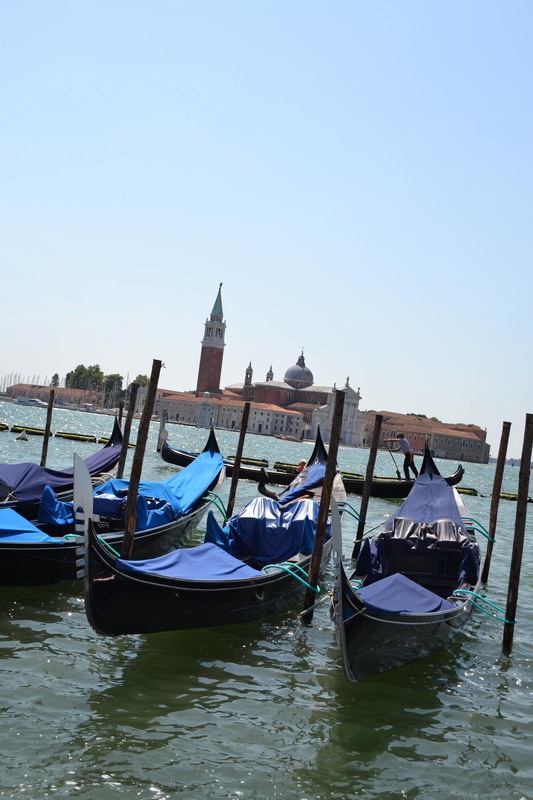 There really is no place like Venice. I feel blessed to have seen it. 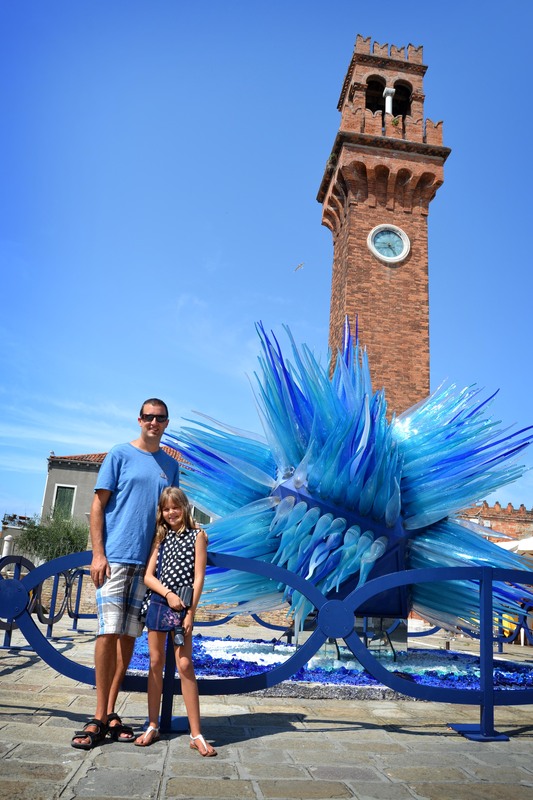 This entry was posted in Travel Log and tagged Burano, Doge's Palace, Murano, Venice. Tuscany is the place of my dreams. 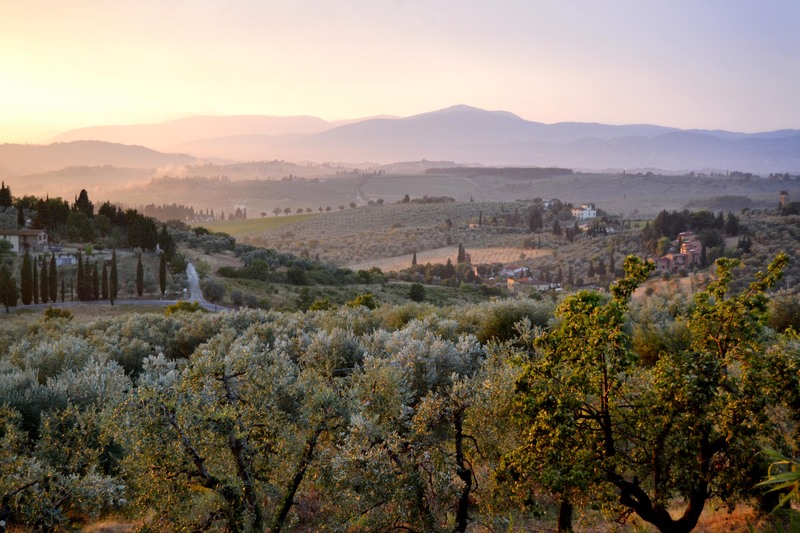 All of my Italy dreams, for decades, have been wrapped up in visions of the beautiful Tuscan landscape, with hopes of quiet sunsets, peace, and preferably, a classic Italian soundtrack playing in the background. In discussions before we left on this trip, Dwayne and I both realized that I had some pretty high expectations for this leg, and that I would be wise to remember that sometimes things don’t work out the way we expect. “Things are what they are. We are unhappy because we expected differently.” (I have this wise quote on one of my Pinterest boards, but I’m afraid I don’t know who said it first. If it’s you, feel free to take credit.) Anyway, I was focused on letting our Tuscany experience unfold as it would and just enjoy it. It was more than I could have ever hoped. I could fill pages and pages with my thoughts and stories from these 5 days, but I’ve saved that for my personal travel diary, because you have your own life to live and probably don’t have hours to read about our travel ups and downs. Instead, can I share just 4 snapshots of joy? Four treasures that I will hold in my heart from this beautiful experience. 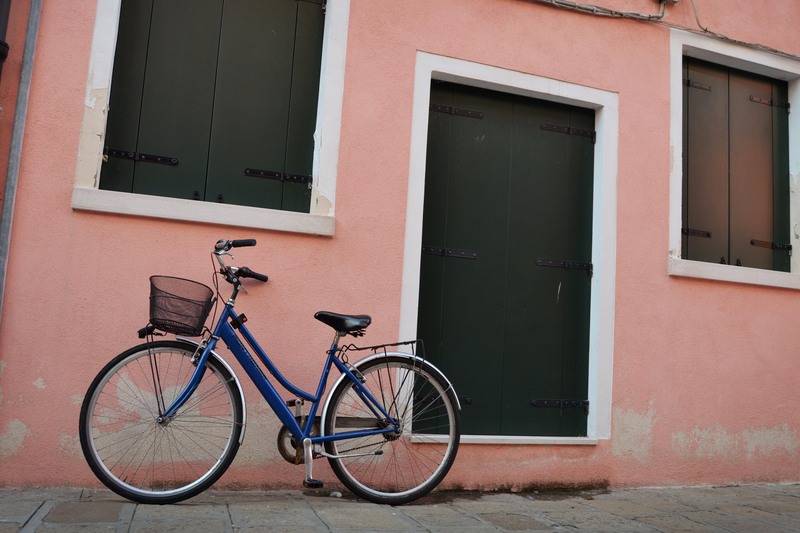 Snapshot One: We spent our first full day in Florence on bikes. I love Hansen family bike rides, and there were some great parts to this one, including an incredible view of Florence from the Piazza Michelangelo. But, a good portion of this day was spent arguing with Dwayne and feeling quite angry and frustrated. Whatever. It happens. I was hoping for a more blissful bike ride, but that’s not how it worked out. We worked it out eventually and carried on with our day, and later, after dinner, we left the kiddos getting ready for bed and headed out on one of our many mini-dates. (PS. This is an amazing perk of traveling with a kid of babysitting age!) We eventually found ourselves on one of Florence’s beautiful bridges, watching the sunset, admiring the beauty of the river, the sky, the city, and wouldn’t you know it, each other. Joy on a bridge. 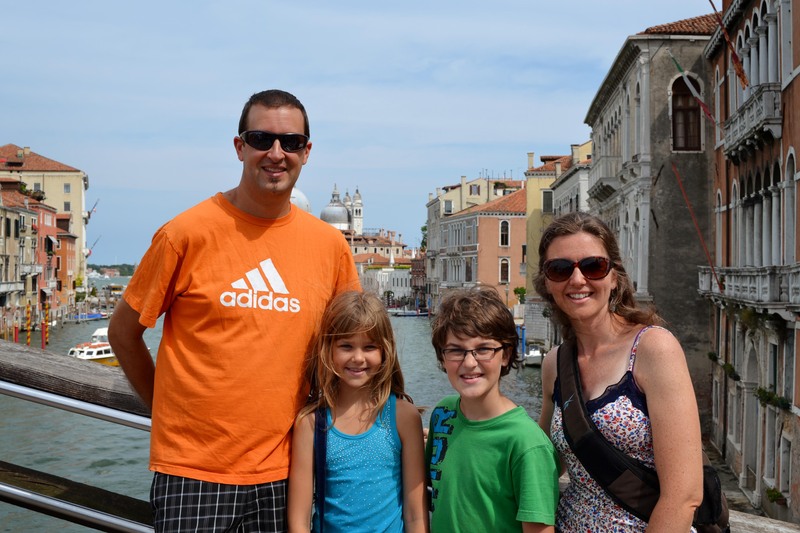 Snapshot Two: Long before we come to Italy, we booked a Pizza & Gelato making class, which received glowing reviews online, and which we were all pretty pumped about. The class was in a kitchen right in Florence, and since it was a bit of a splurge already, we didn’t book the upgraded version that took you out to a vineyard in the Chianti region with wine tasting and beautiful views. Of course, I wanted to book this one, but in the end, it was sacrificed to our budget, and we were happily looking forward to the class in town. The day before our class, we received an email asking if we’d be interested in a free upgrade to join the tour in Chianti! Sweet Tuscany hallelujah, yes! I was so pumped to have this one evening out in the countryside where I was sure all my Tuscan landscape dreams would come true. We left Florence in the heat and sunshine at 6pm, and by the time we were halfway to the vineyard, huge storm clouds blew in, the heavens opened, and it poured rain. I mean, poured! On the one hand, we were quite giddy about it. We really hadn’t seen a rain like that for months, and after the heat we’d been enduring for 13 days in Italy, not to mention months in the desert, it felt, smelled, and sounded amazing. On the other hand, it didn’t really look amazing. My dreams of Tuscan views and peaceful countryside were washed away as we got out of the van, running to the kitchen for shelter. So I put on my “let it be what it is” pants, and focused on enjoying the cooking class in this gorgeous Italian kitchen full of lovely people and delicious ingredients. Then, within about half an hour, maybe an hour before sunset, the rain stopped. The sun came out from under the clouds. 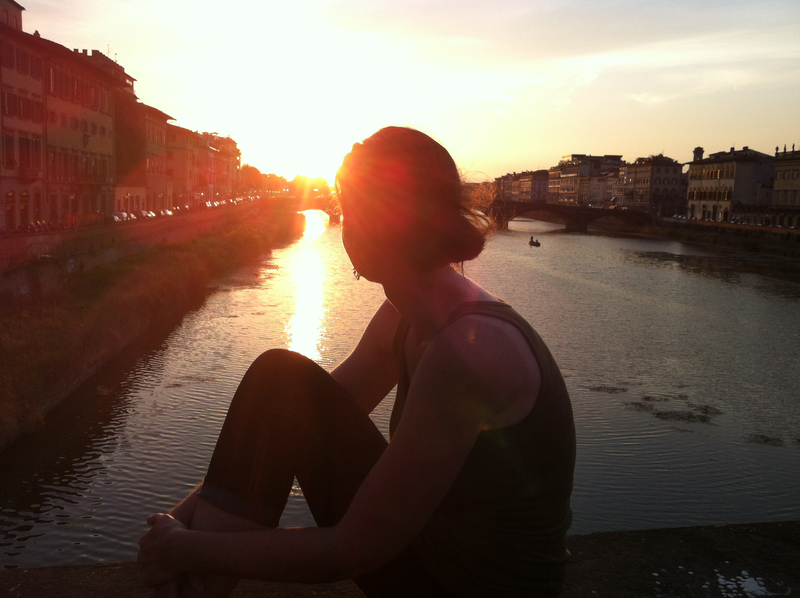 And it felt like I was personally treated to the most stunning and refreshing Tuscan sunset I ever could have imagined. I can’t fully describe the moment or the joy of the whole evening, but I can tell you, as I stood at the fence, looking out, that I felt the presence of my generous heavenly Father who delights in giving good gifts to his children. I literally felt his joy in my joy. Joy in a perfectly imagined moment come true. Here in this quiet room were a handful of musical and religious books, handwritten by monks hundreds of years ago. 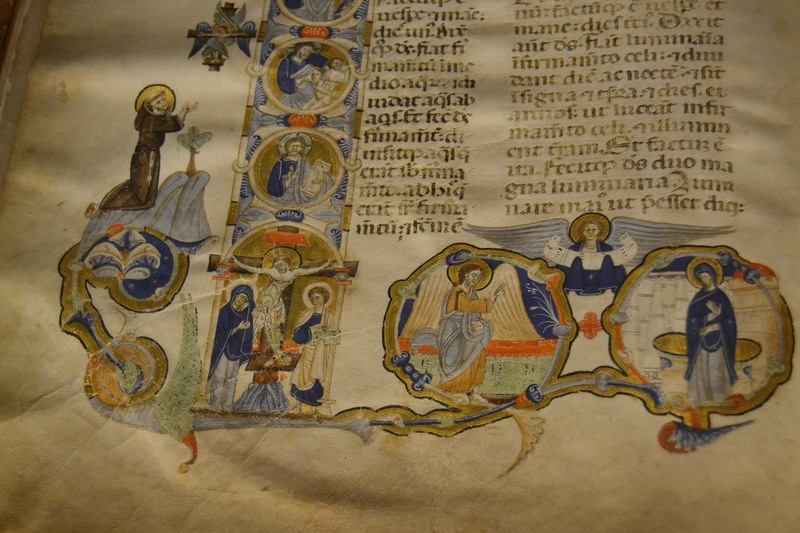 Illuminated letters and illustrations filled the sides of the pages. They were so beautiful, and here they were in person, bound and meticulously copied by dedicated men. I spent about 20 minutes, practically by myself, marveling at these books while everyone else photographed Michelangelo’s David downstairs. (Who, by the way, is hugely popular for a reason. Quite impressive.) But it’s funny how different things speak to different people. These books spoke to me, and I was a little bit in awe in that room. Joy in nerdy book love. 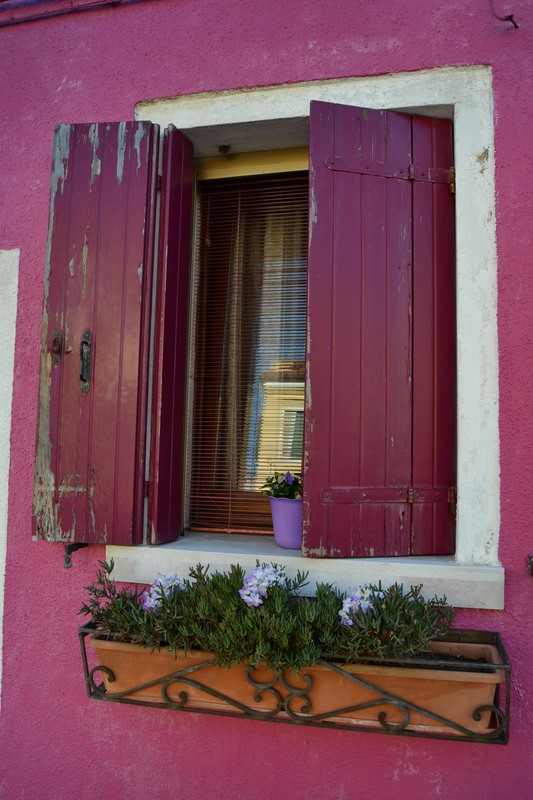 Four: On our last day in Florence we took a day trip to Cinque Terre to visit the 5 little towns on the quieter side of the Italian Riviera. This day turned out to be worthy of a chapter in a book, and ranged from the highs of an amazing coastal hike on the Mediterranean to the lows of drifting off to sleep on a concrete train station floor at midnight. I would call it a series of unfortunate events, but it’s not really unfortunate when you still have an amazing adventure day, no one is harmed, and you leave with a great story. We are fond of great travel stories. 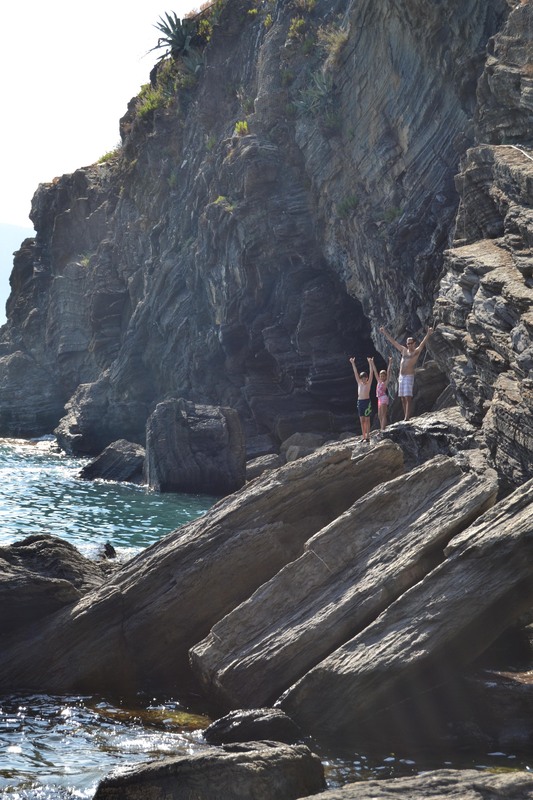 But the snapshot moment of this day came in the little village of Vernazza, where we finished our beautiful hike, ate some beautiful gelato, and swam in the beautiful sea. Dwayne and the kids were jumping off some rocks, the sun was setting, I was perched on my own rock with the waves lapping at my feet and feeling the blessing of the moment. Joy in my family and the sea. 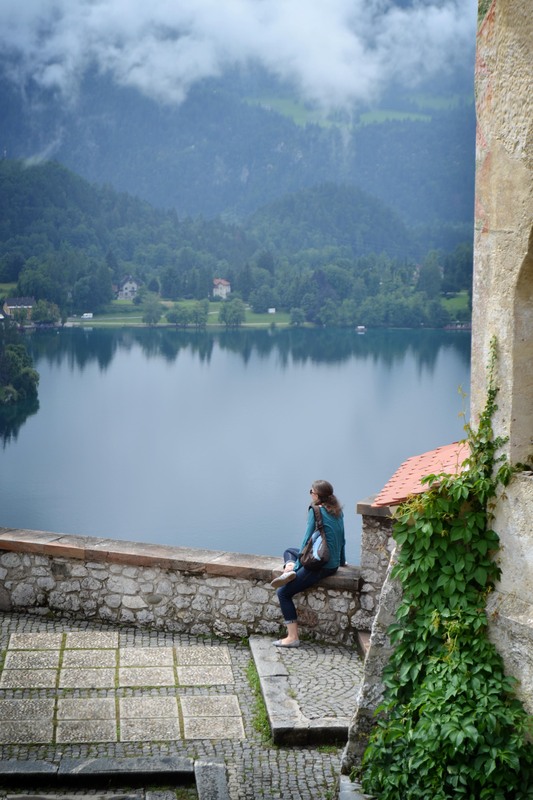 Travel is not an uninterrupted lineup of joyful snapshots. In fact, it’s more like a series of routine or forgettable moments interrupted by memorable ones. 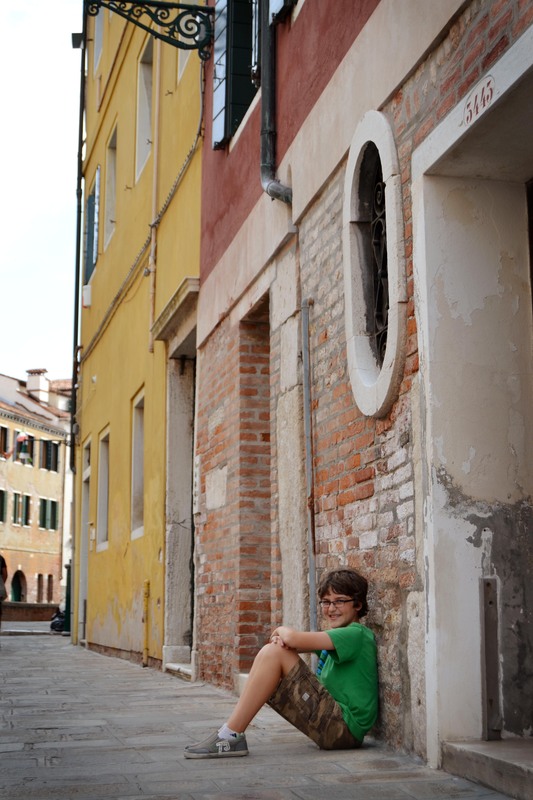 All of those ordinary moments of travel simply prop up the treasured snapshots. But when I look back on this trip, I probably won’t remember most of the mundane walking and waiting and sweating and riding and packing. It’s the snapshots that will come to mind. I think that’s how it is for most of our lives. A lot of ordinary moments that give life to outstanding ones and fill a treasure box of memories. So cheers to you today, and both your ordinary and outstanding moments. 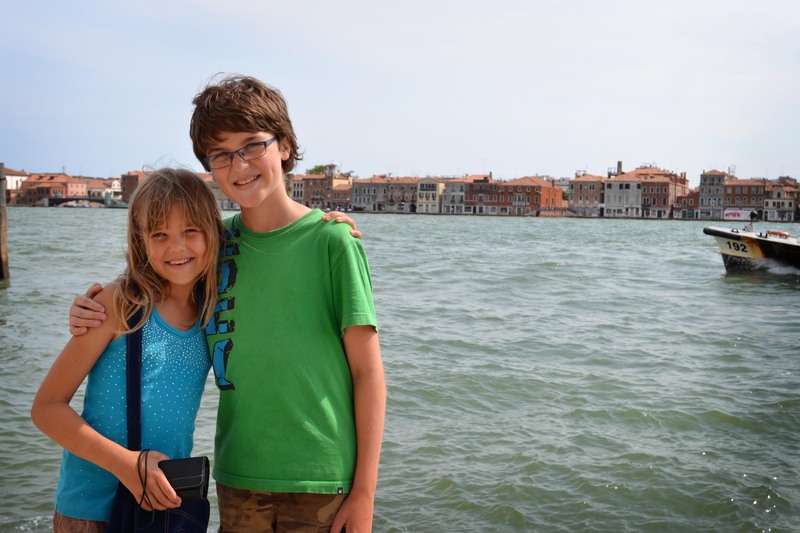 This entry was posted in Travel Log and tagged Italy.